How much does 'canting' your rifle affect accuracy? Can you judge when your rifle is perfectly level in the field? It isn't as easy as you might think. When you look at the hands on a wall mounted clock when the minute hand is 1 minute past the hour, do you think if your rifle is canted the same angle as that minute hand that this is enough to worry about in the field? If you answered yes to the above question, you likely already understand how important it is to hold your rifle level for a precision shot. If you answered no, I would like to illustrate how important it is. First, one minute past the hour really does'nt look like much. Even two minutes does not look too bad. One minute past the hour is 6 degrees. How much can that hurt you? The long answer is that it depends on your distance, zero range, velocity etc......The short answer is for long range shots, it hurts you alot. Why? Below are two pictures that help illustrate the principal of why it happens. 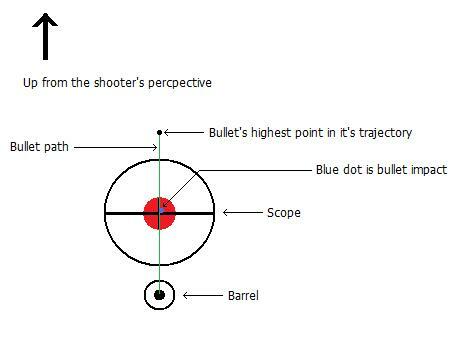 You need to remember that your rifle's barrel is tilted up to get the bullet to cross your scope's line of sight. 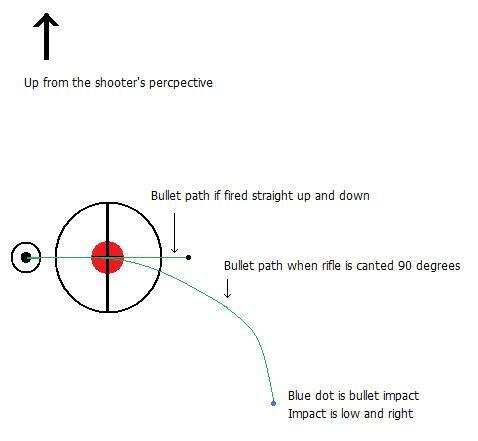 If you envision a bullet leaving the muzzle on a path where it ends up above your line of sight to the target so that it may drop down into the target. Now envision holding your crosshairs dead on the target but the rifle is held at 90 degrees where your scope is on the right hand side of the barel instead of straight up and down. Now the barrel is no longer tilted up but angled to the right. The bullet's path no longer is up but it is now to the right. It still is on a path that will put itself in line with the crosshairs, but straight right not straight up where it should be. 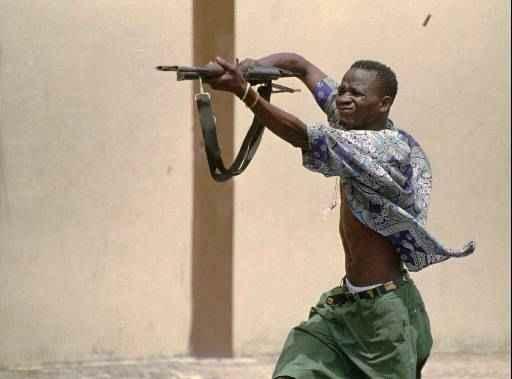 When the rifle is canted to the right, impacts low and right will occur. To the left and impacts will be low and left. How much so will depend on how many degrees the rifle is canted. Remember, one minute past the hour is only 6 degrees. It is very hard to judge that in the field. So, how much though will 6 degrees affect the impact? For one of my favorite rifle and load combinations, it works out to 11" at 600 yards. For another rifle/load combo it is 10". Add another 200 yards and it doubles to 20". That is a gut shot, a hind leg shot or a clean miss on a coues buck or even an elk. Hence the reason I use a scope mounted bubble level. They are cheap light and very effective. They are worth their weight in gold twice over when trying to cleanly kill a coues buck at long range. The link below is just one of several options available. The illustrations below should help you understand why. Obviously, the pictures above show the worst case scenario. No body is going to shoot at a coues buck with the rifle canted 90 degrees. The point is to exaggerate for clarity. The less the rifle is canted, the less more precise it will be. That's a very good explanation. Thanks for taking the time to write it up. Here is an actual field test. Pretty impressive and very telling. Thanks for sharing coues7! It is always nice to see it first hand. What would be the recommended mounting style for that scope level? On the scope or on the rail? Honestly, it boils down to personal preference. Great info! Thanks for sharing it! So how does one exactlly keep the bubble within the lines from 1 degree left or right while holding the crosshairs on a tiny coues deer at 400 yards while buck fever is setting in? Do they sell a product for that?? Seems like this thread has become more of a laughing stock than it is usefull. Without being a smart a$$ its call diaphramatic breathing. If you cant figure that out, try beta blockers. You can buy those at your local pharmacy. OK I admit I was a smart a$$. Sorry. On a serious note. If my bubble is bouncing around like that I'll pass on the shot until I can get my nerves in order or until he walks out of sight which ever comes first.